Genesis collects detailed rainfall, river flow and lake level data from around our hydro generation sites every five minutes. River conditions can change very quickly, so the data is updated on this website every 15 minutes. Please monitor the conditions regularly before embarking on any water-based activities. Flow data is also available from the Genesis flow phone 07 386 8113 or Free Phone number 0800 435 697 – (0800 4 flows). River conditions can change very quickly, so the data is updated on this website every 15 minutes. Please monitor the conditions regularly before embarking on any water-based activities. Flow data is also available from the Genesis Energy flow phone 07 386 8113 or Free Phone number 0800 435 697 – (0800 4 flows). Note: the hydrology data on this website is provided for general information purposes only. The data shows rainfall and river flow information, it is not a forecasting tool. River users should check rainfall and river flow data, alongside weather forecasts to make a decision about whether it is safe to enter waterways. 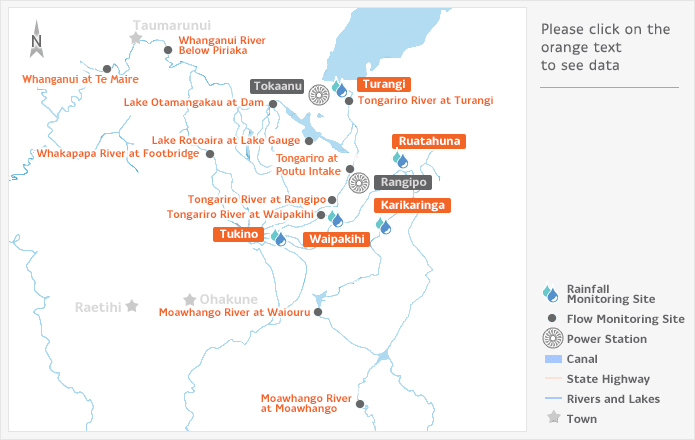 Click the orange text on the map below to access hydrology information for the Tongariro Power Scheme. If you have questions or comments you can contact Genesis Energy's Hydrology Staff. Click below to access hydrology information for the Tongariro Power Scheme. Rainfall information helps Genesis Energy predict river inflows. The rainfall sites listed below cover a large geographical area from the flanks of Mt Ruapehu to the Kaimanawa Ranges. Click on the site name to view recent rainfall trends. Water is utilised from rivers in the Tongariro, Whangaehu, Rangitikei and Whanganui catchments. River flows can vary quickly and it is a good idea to check the weather forecast and assess flow conditions on the river before heading out. In some river systems, rainfall in headwater catchments will result in rapid increases in river levels downstream where there may be little rainfall. Click on the site name to see recent flow trends. Lake Otamangakau is an artificial lake, created during the development of the Power Scheme. This lake is renowned for its excellent trout fishing. Lake Rotoaira is the source of water for Tokaanu Powers Station. This lake is owned by beneficial Hapu of Lake Rotoaira and is also known for its good trout fishing. Click on the site name to view recent lake level trends. Assess the conditions for yourself before entering the River. A high level of skill is required for these releases. Stop the spread of freshwater pests! All equipment that has come from any other fresh waterway (regardless of island) must be decontaminated using approved methods (see CheckCleanDry) before entering the river. Please do not rely on the ‘dry' method alone as the inside of kayaks take a very long time to dry out! Cleaning solution is available at the entry and exit points during recreational releases. For the Rangipo Dam release, Grade 4+ rapids require a very high level of competence. You MUST be aware of the location of the exit points before Tree Trunk Gorge and Waikato falls to safely utilize this release. 1. Recreational releases from Whakapapa Intake require a minimum flow of 16 cumecs in the Whakapapa River. If there is still insufficient flow, then the event is cancelled. 2. Please check the WWNZ website for details on the release. Updates on the likelihood of the release are posted 24 hours prior to the event and the final decision is made on the morning of the release. 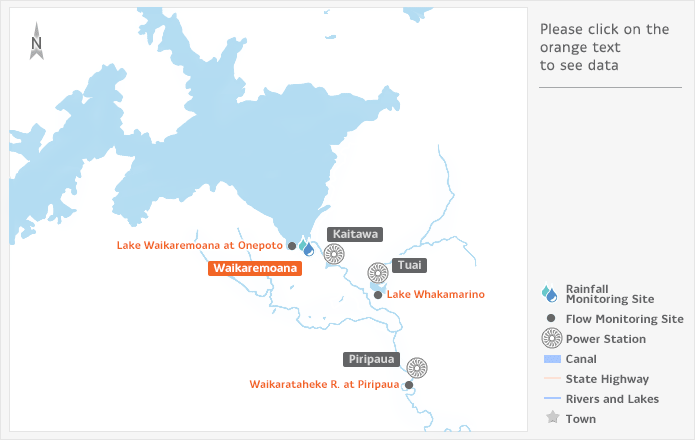 The Waikaremoana Power Scheme has 3 power stations that utilise water predominantly from Lake Waikaremoana. The power scheme is among the oldest hydro schemes in the country with the main power station (Tuai) being commissioned in 1929. Click on the orange text on the map below to view hydrology information. Click below to view hydrology information. The Waikaretaheke River flows from Lake Waikaremoana and joins with the Waiau River near Ardkeen. Kayakers utilise the river throughout the year during recreational release events. Click on the site name for recent flow trends. Lake Waikaremoana is the main water source for the power stations at Waikaremoana. Lake Whakamarino is an artificial lake created during the hydro development. Both lakes are utilised by recreational anglers. Genesis Energy's resource consents for the Waikaremoana Power Scheme require recreational flow releases from Piripaua Power Station and Tuai Power Station. Assess the conditions for yourself before entering the river, and please ensure anyone using the river is aware of these flow changes. All users must be aware that there is currently a fallen tree over the river by the gravel pit – inform yourself of where this hazard is located and appropriate exit points prior to accessing the river. Note: Please check the WWNZ website for details on the release. Updates on the likelihood of the release are posted 24 hours prior to the event and the final decision is made on the morning of the release. The Tekapo Power Scheme has 2 power stations that utilise water from Lake Tekapo. Tekapo A Power Station generates electricity from water that passes through a 1.4 kilometre tunnel from Lake Tekapo. The water then passes down the 26 kilometre Tekapo Canal and generates electricity through Tekapo B Power Station, located on the shores of Lake Pukaki. Lake Tekapo is the main water source for Tekapo A and Tekapo B power stations. Lake Tekapo runs north-south on the northern end of the Mackenzie Basin in the South Island. June and July – Maximum Level of 710.9 masl. *The level of Lake Tekapo may be further reduced to 701.8 masl between 1 October and 31 March if the Electricity Commission determines that reserve generation capacity is required. The spill flow from Lake George Scott travels down the Tekapo River before entering Lake Benmore. This data enables awareness of changing river conditions that may propagate down the catchment towards Lake Benmore.